Accurate vision involves much more than good eye health. The brain integrates signals from the eyes with information from the motor, balance, and auditory systems to create an accurate view of the world. 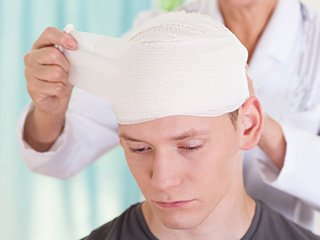 Following traumatic injury, one or more components of this complex system may be damaged. Receiving a thorough vision assessment following a traumatic injury can speed treatment of visual deficits as well as overall recovery. Vision begins when light enters each eye, stimulating cells on the back of the eyeball. These signals are summed and sent through the optic nerve extending from the back of each eye. The optic nerves cross over to the opposite side of the brain before relaying visual information to the occipital lobe, found in the very back of the head. Here, visual information undergoes more complex processing to identify objects, see movement, and visualize color. Damage to any part of this pathway -- from direct trauma to the eyes themselves to head injury -- may disrupt accurate visual processing. Visual acuity. Some individuals may experience nearsightedness (poor distance vision), farsightedness (poor close vision), or other issues with visual acuity following injury. These are most often treated using corrective lenses. Loss of visual field. Sometimes, a person may lose ability to see out of an entire quadrant or half of the visual field. Double vision (diplopia). Double vision often occurs after injury, affecting almost all everyday activities. Visual alignment. When the eyes turn inward, outward, up, or down, you may have difficulty fixating on an object, smoothly tracking moving objects, or scanning. Visual-motor integration. Loss of eye-hand or eye-body coordination often leads to difficulty performing everyday tasks. Visual-auditory integration. The visual and auditory systems communicate constantly. Injuring this system impairs ability to associate what is seen with what is being heard at the same time. While certain vision problems can be easily treated with corrective lenses, others may require vision therapy. A vision therapist will work with you to practice skills to improve coordination of eye signals with behavioral responses. Although some visual skills take months or even years to fully recover, practicing daily improves the likelihood of a full recovery.